All the pleasure of Saboteur face to face. Players build a path to gold nuggets together while trying to be the one to reap the most. The most cunning and insightful dwarf will be more likely to become the king of the underground. Secret doors, broken tools, landslide ... All bad moves are allowed! And if you can not get your hands on a second dwarf, you can always try your luck solo. Will you be able to avoid all obstacles and build the most interesting tunnel for your dwarf? Be careful this game is an extension of Saboteur and cannot be played alone. 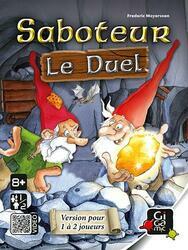 To be able to play it you must have a copy of the game Saboteur .